This section of InTopTen is the place where you can find out everything you need to know about the best home saunas of all shapes and sizes. Make the right choice when it comes to buying your next sauna in 2019. We aim to take the confusion out of buying saunas and give you the information you need to buy smart in clear and concise reviews. Whether it’s your first sauna that you’re looking to purchase or just replacing your old sauna, we aim to help you with the decision making process. There’s plenty of choice out there on the market, so it’s important to know what you want so you can buy the right home sauna for your needs. 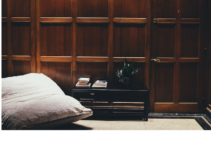 Most people who are looking to buy a sauna have done enough research to know the benefits of a sauna, but need help with what heating source to choose or size of sauna that’s right for them and their needs. 4. What Is A Sauna And How Does It Work? The JNH Lifestyles 2 person infrared sauna is the best selling home sauna on the market, and it’s pretty obvious why. The sauna aesthetically looks amazing, the price point is relatively cheap at below $1500 and it can be set up easily in about 2 hours. In addition to the easy setup and great price, you also get a whole range of additional features. 7 Carbon Fiber Far Infrared Heaters. The sauna comes with ETL approved carbon fiber infrared heaters and provide you with the best performance heaters within this price range. The heaters are situated at the back, side and calf areas to maximize heating area. This particular sauna is well known for being a solid, reliable and well made sauna. The construction is FSC Certified “Green” Wood, with no added chemicals. There’s no plywood at all and the double layer Canadian Hemlock T&G timber provided the best possible insulation. With such good insulation comes the flexibility of where you can place your sauna. Positioning the sauna in tight spaces isn’t a problem as there’s no worries about heat expansion. A high level of construction and finish all round. The manufacture is so confident about the quality of build that they give a 5 year warranty as standard on the sauna. So if you have any quality or mechanical issues, you are more than covered with the guarantee. This also includes the audio system. All components are UL listed and ETL Approved. Another great thing about this sauna is the Built-in AUX control and 2 Premium Speakers. so you can pump in your favourite tunes while you sweat it out. Relax to some chilled out music while you relax in your sauna, or maybe an audio book. A digital control comes with the kit, which allows you to control the temperature and the duration of use of your sauna from within the sauna itself, rather than having to get up and make the adjustments from outside. This is probably the best pound for pound sauna on the market. It’s reliable, heats really quickly and can easily and comfortably house 2 people and it’s very spacious for one person. A relaxing addition to any home. The worry with most people about saunas is the ability to reach the required heat. With this model, there is no issue with the generation of heat from the infrared heaters. Typically you can get to 125 degrees in 10 to 15 minutes. It’s no secret that JNH make awesome home infrared saunas and here is another one to add to the rest. The Lifestyle Joyous 3 person Canadian hemlock sauna is slightly larger than the JNH Lifestyles model, but are similar when it comes to features but with a few extra add-ons. Awesome for 1 or 3 people! Overall, the reviews online for this model is extremely positive and it’s unsurprising why. It’s spacious enough for 3 people to comfortably enjoy the sauna, but the added bonus is that the bench is big and wide enough for one person to lay stretched out on! If you really want to kick back and relax in a sauna then this is the model for you, as most of the two person saunas aren’t wide enough for the user to lay down fully. If you’re someone that would like to lay down to relax, this is probably a better option for you. Like the Lifestyle model, this sauna has no shortage of heaters. 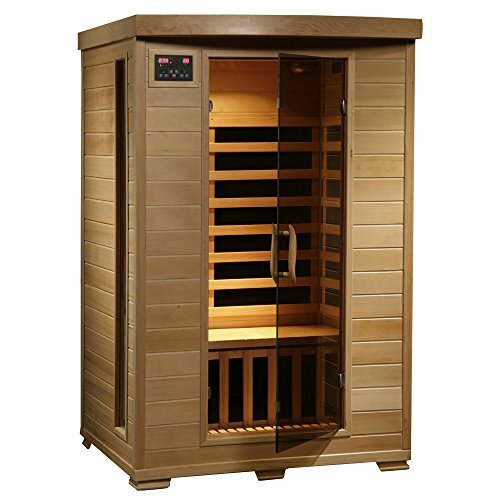 It comes with 8 carbon fiber far infrared heaters, one more than the previous model due to the increased size of the sauna. This will make the sauna heat up quickly and most importantly, more efficiently. As with all JNH saunas, the Joyous model’s heaters are installed within the framing of the sauna so that heat is targeted to the key areas of the body such as the back, rear, sides and calves. As with other JNH models, the sauna is well made with 100% Canadian hemlock with zero added chemicals. The great thing about this sauna is the speed of assembly due to the tongue and groove planks. This makes it even quicker to build and easier too!. 1 to 2 hours max. Building the sauna is really easy, especially as its “Tool Free” designed! This means that you need no tools to assemble as the panels use buckles to link together, rather than screws or nails. This sauna has dual wall insulation which keeps it nice and toasty without any heat loss. Safety glass in the door, a premium sound system with 2 speakers and amplifier, LED lighting, digital control panel for adjusting the temperature and duration, and a long 5 year warranty for all parts, including the audio and speakers. One of the best looking saunas I’ve had the pleasure of road testing,the Blue Wave 3 person sauna is really easy to put together. It’s a two person assembly job that should take around 90 minutes to put together. It comes in 3 boxes, with most of the work coming in the form of getting the boxes into the house and unpacking it! The Blue Wave heats up really quickly and maintains the heat excellently. This is due to the 7 energy efficient carbon heaters. They have a 1,740 Watts output, which makes the Genesis Infrared Saunas InfraWave FAR heaters emit a comfortable and relaxing infrared wavelength of heat to the parts of the body that will be most beneficial to the body. Like with most saunas on the market, the Blue Wave Genesis is built from premium grade solid Hemlock wood tongue and groove joinery. The tongue and groove system makes assembly extremely quick and easy. One the uber cool features of the Blue Wave Genesis sauna is the 7 color chromotherapy system. This basically allows you to relax in your sauna with heat and color mood settings. It will omit 1 to 7 rotating colors into the sauna to give you that added relaxation value. There’s two EZ Touch inside and outside LED control panels so you can quickly and easily adjust the temperature and color system from inside or outside the sauna. There’s interior and exterior lighting so you can read a book while enjoying the relaxing warmth of the sauna. To allow some fresh air into the sauna, there’s ceiling vents that you can adjust if desired. Not only can you read, have some color therapy and relax in the warmth of your sauna, but you can also listen to your favourite tunes with pre installed user friendly radio with CD player, AUX mp3 connection and built in speakers. One of the most impressive features that I found from using this sauna is the space inside. It will easily and comfortably accommodate 3 people and includes 3 ergonomically designed backrests which really help with muscle fatigue and provides the user with relaxation and comfort. The bench is extra deep and run along the back walls of the sauna. Couple this with the electronic oxygen ionizer and you have the ultimate sauna! This is pretty awesome! The sauna releases O2 and negative ions that help purify the air and kill odour causing bacteria in the sauna. Good or what! Keeping the air fresh and clean in the sauna is really important and a feature that isn’t readily available on other models. All Genesis Saunas are backed by CE, CETL, RoHS and ISO 9001 certifications, internationally-recognized seals of quality, safety and professional manufacturing. 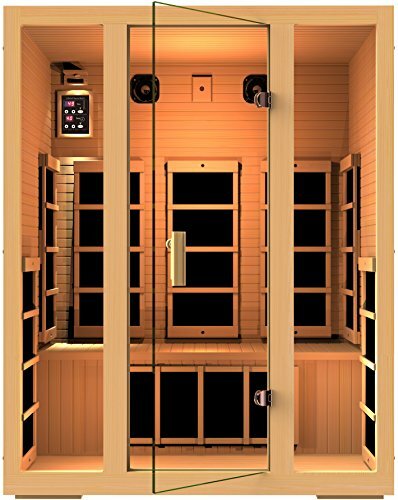 The Better Life BL6109 1-2 person carbon infrared sauna is perfect for the family or individual that wants a sauna but has extremely limited space. This sauna can be a tight fight for 2 adults but the small size means it heats up quickly and works wonderfully if you’re willing to take turns. This sauna arrives with easy snap together assembly that took us less than 45 minutes to fully assemble. Obviously we’ve got some experience, but others we’ve talked to were able to do the same. It also includes a dual interior and exterior soft touch control panel that features an LED display with easy to read temperature and time. One of the nicest benefits of the Better Life sauna is the reduced wattage floor and lower bench heaters so that no matter where you step or sit the surface is a comfortable temperature. Included with each sauna is a full radio with CD player and mp3 auxiliary. Additionally there is a chromo therapy system with a remote to cycle through the color array and brightness control so that you can set how light or dim you would like the light to be. 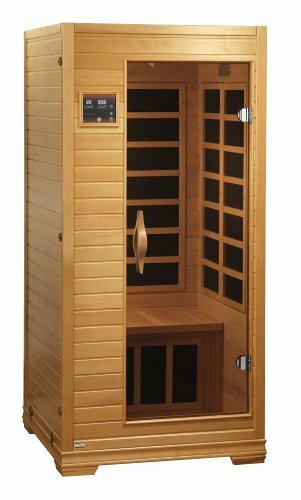 This sauna can be installed nearly anywhere with a regular outlet as it runs on a typical 110 volt outlet. A good choice of home sauna is you are short on space. It may be compact but it can comfortably fit 2 people in there without it feeling crowded. Constructed with reforested Canadian hemlock, it environmentally friendly and extremely sturdy and well built. Talking of being well built, the Dynamic Barcelona sauna comes with double paneled walls as well as interior planks that are much thicker than other sauna retailers. This means that the insulation is far superior. It will hold in heat and make this sauna much more heat efficient. Better heat retention means less waste means less energy and less running costs. A win win situation! 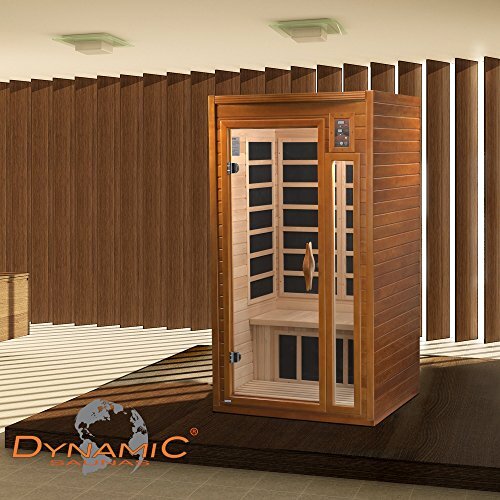 The Dynamic Barcelona sauna comes with 6 low EMF infrared carbon heating panels including a foot heater to reach those tension areas of the body. With this source of heat from the sauna, it penetrates the skin 40% more than saunas heated by ceramic tubes, which helps to maximize therapeutic benefits of sauna usage. This sauna heats up to 130F which is lower and safer than other heat sources. Its most effective at 120F giving the user a much more lengthy and enjoyable sauna session, which maximize all potential health benefits. To get this sauna out of the box, built and functioning will take 2 people 1 hour to do, which is really fast construction for a 2 person sauna. Assembly is simple snap joints, so no nails, screws etc. There’s an interior and exterior soft touch control panel and LED display featuring sauna temperature and time functions. To add to the overall relaxation experience of a sauna, the manufactures have added in a built in speaker system with an mp3 aux connection so that you can play your favorite music while sweating it out. Powering the sauna is easy. One plug into any dedicated 15 amp 110 volt outlet and you are up and running. You can installed this sauna on carpet and at any indoor location including the basement, garage, home gym or fitness room, master bath or walk in closet. A really nice looking 3 person sauna, the Lifesmart Infracolor Ultimate Sauna is non-infrared which means instead of infrared heating, it uses 4 carbon tech and 2 ceramic heaters instead. It’s a bit slower to heat up than infrared, but for people who prefer this method of heat generation, it’s ideal. The sauna usually heats up to the ideal temperature in 30 minutes. In addition to this, it comes with additional reflexology foot heater which is an added bonus! The Lifestyle Infracolor Ultimate Sauna is very spacious and will accommodate 3 people quite comfortably, although it is much more suited to 2 people. The Lifesmart is ideal if you have a small space in your household for your sauna to live. Despite this, it uses its internal space really well. Like the previous sauna review listed on this page, the Lifesmart has a multi spectrum Infracolor chromo therapy light system, which is a really cool addition to the overall relaxation experience of the sauna. It comes with remote control so that you can operate the lighting system easily from within the sauna itself. This is a serious contender if you’re after a sauna that is spacious and non-infrared heat powered. When you do go to buy a sauna, please plan where you are going to house it. Take a close look at the dimensions listed alongside the sauna listing on Amazon.com. Also measure the space where you plan to have the sauna set up. Measure width, depth and height, as well as taking into consideration door openings and ventilation. Saunas come in a wide range of sizes and it is important to pay attention to the particular dimensions and select the one that will work best for your family. Have a good think when it comes to selecting a sauna. How many people will be using it at the same time. A good rule of thumb is to buy a sauna that will easily accommodate more than one person. Reason for this is so you have plenty of space for yourself. Normally single person saunas are small and only allow for the user to sit up and not lie down in them. Let’s say a sauna states that it will fit 4 people. Really what that means is it will be most comfortable for 3 people to use, but it will accommodate 4. Make sure you take this onboard as nobody wants to use a sauna that is uncomfortable to sit in, due to lack of space. Lie down or not to lie down, that is the question. Lie down or sit up? Tricky question for some, as this could effect where you place your sauna. If you have a tight space to house the sauna, then you might have to forego the lying down option. If you do decide that you would like to lie down in your sauna then you will have to get a sauna where the benches are large enough that you can recline comfortably. Bottom line is to carefully consider the sizes of the saunas you are planning to buy as well as thinking about its usage. Below I have listed the best saunas on the market by size. Hanko is one of the big names in the world of saunas. They have always produce high quality products that do what it says on the tin and this model is no different. The Hanko Harmony Infrared Sauna is perfect for people with limited space or who want to use their sauna on their own. Although the sauna is spacious inside, it is most comfortable for single person use. The Hanko Harmony is made from Hemlock wood on both interior & exterior parts of the sauna. It comes with the revolutionary carbon emitter far-infrared sauna heating system. There’s carbon heating panels places below the bench to reach key areas on the body such as the calves, to give added relaxation through heat. The sauna is prefabricated which mean that all wall panels are finished internally and externally. Assembly is made really easy with the tongue and groove construction, making it quick and easy to put together. There’s no nails, screw or glue to put this sauna together due to the integral buckling system for seamless and fast assembly. Not only does this sauna heat up quickly, but it allows you to enjoy that warmth with your own tunes pumping from the internal speakers. Audio features available are FM tuner, iPod/iPhone/Android Phone and MP3 player compatibility. There’s a Saunatone Touchpad Audio interface which can be controlled from inside the sauna. Ceiling Mounted Speakers for your Infrared Sauna. Overall this sauna is an extremely good buy for those who want a sauna to chill out in on their own. Good quality construction and some really nice features, such as lighting and internal speakers. This sauna is pretty amazing when it comes to value for money. It has all the benefits of the larger 2 or 3 person model, but fitted within a smaller space! If you like to sauna solo or don’t mind taking it in turns with your partner or family members, then this is probably one of the best single occupancy saunas on the market. 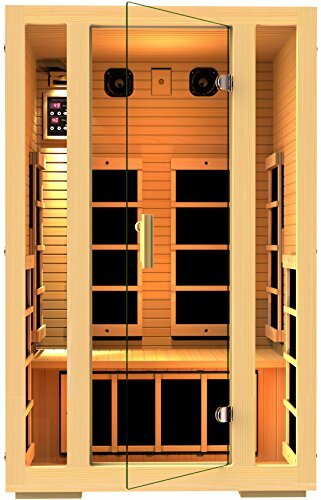 The Lifestyles Joyous 1 Person Far Infrared Sauna sauna really does hold its own against the competition, even though it measures up at only 35.5” (w) x 35.5” (d) x 75” (h). It will fit into most homes and apartments with limited space. Included in the sauna kit are 6 carbon fiber far infrared heaters that are placed within the sauna to target to known problem areas including the sides, back, lower back and calves. This helps to sooth and comfort aches and pains. Like most saunas from JHN, construction is made from high quality Canadian hemlock which gives the sauna that traditional look as well as making it look strong and sturdy. Assembly of the sauna is quick and simple. I know people who have built it on their own in less than an hour. This is mainly down to the tongue and groove construction which makes assembly even quicker to set up. It also comes with a transparent door with special safety glass for high temperatures. Insulation is pretty good on this model, and will keep the heat inside where it’s needed. The dual wall insulation will also keep the rest of your home safe from moisture. There is a really good audio system fitted that will pipe in music to help you relax even more than you can already in a sauna! LED lighting is also included and is controllable from a digital control, as well as being able to adjust temperature and duration of the sauna session. The Radiant 2 Person Sauna has a lot going for it. It doesn’t take up much space, it’s well built, has plenty of perks and it’s ideal for 2 people! If you’re looking for a spacious 2 person sauna that can fit into a household where space is limited, then the Radiant sauna ticks the boxes. It heats up quick as well. 46 to 100 degrees in 25 minutes and to 130 in roughly 40 minutes. Constructions is relatively easy despite some people saying that the manual photos are poor quality. The written instructions are fine and very clear to follow. If you do get stuck then head on-line as there is plenty of information on there to get you out of trouble should you need it. (You probably won’t). The Radiant sauna comes with 6 carbon heaters that will deliver a nice and healthy 1725 watts. This will make your sauna lovely and toasty with heat that will go up to 141 degrees Fahrenheit. 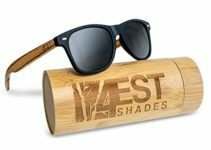 No surprise about the construction, as it’s made of solid Hemlock and the added benefit of tongue and groove components, notched with convenient buckle assembly. The great thing about this sauna is the added extras that it comes with. EZ-touch interior and exterior LED control panel that includes a sound system with radio, CD player, and AUX for connecting mp3 players and high end built in speakers. Also included are a chromo therapy light, exterior light, towel, magazine rack, oxygen ionizer, 2 backrests, and conveniently tinted glass for privacy. The JNH Lifestyles SG2HB 2 person sauna is one that you can have built in under an hour, from box to fully assembled. That’s why this is one of the best selling saunas on the market. Not only that, it’s well placed in terms of pricing. Designed for 2 people to sit comfortably or 1 person to stretch out and relax even more! In addition to the easy assembly, it comes with loads of features. It comes with 5 Carbon Fiber Far Infrared Heaters that heat up to maximum temperature in 20 minutes and is ETL Approved. Insulation is really good. I find that the heat retention is very good and overall very efficient. The sauna comes with 2 Year warranty so rest assured if anything goes wrong, you are covered. Built-in AUX control and 2 Premium Speakers. Digital control that allows you to control the temperature and the duration of use of your sauna. The JNH Lifestyles SG2HB comes with built-in AUX control and 2 internal speakers for added personalization, so you can pump in your favourite tunes while enjoying the relaxing and soothing heat. There is also a digital control that allows you to control temperature and duration. 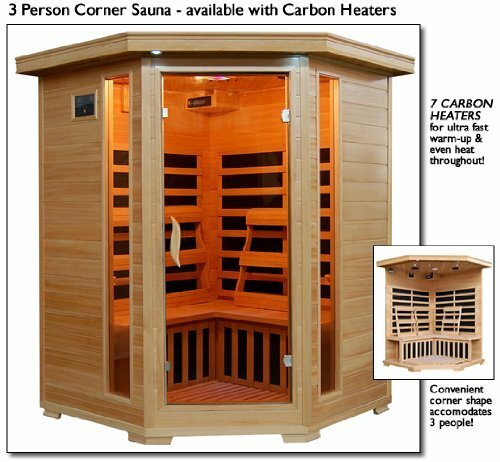 Overall this is pound for pound the best 2 person sauna we have reviewed. It’s built to last and easy to set up. When it comes to easing the tension and stress created by everyday life, there’s nothing better than having a relaxing, therapeutic sauna. Once found only within expensive health spas and beauty salons, it’s now possible to have a fantastic sauna experience within your own home. The Sante Fe 3-Person Infrared Sauna has been created with quality and value for money in mind. With its 5-sided design, this sauna fits neatly into the corner of any room, while providing a spacious interior suitable for three adults. As with other similar sized saunas, the SA2412DX is beautifully styled, with plenty of tongue and groove hemlock and large panoramic windows provided to add to the modern, solid feel of this sauna. The performance of the Sante Fe 3-Person SA2412DX Infrared Sauna is comparable to far more expensive models. With its revolutionary Carbon Composite Emitter Far-Infrared Heating System and carbon heating panels below the interior benching, this sauna distributes heat within the interior to a very high standard. The level of heat is also very easy to control using the adjustable ceiling air vents and touch control panels both inside and outside the sauna. The sauna also comes with tasteful interior spot lighting, including a 7-color Chromo Therapy LED light. A reading light is also supplied, perfect for enjoying a relaxing sauna with your favorite novel. 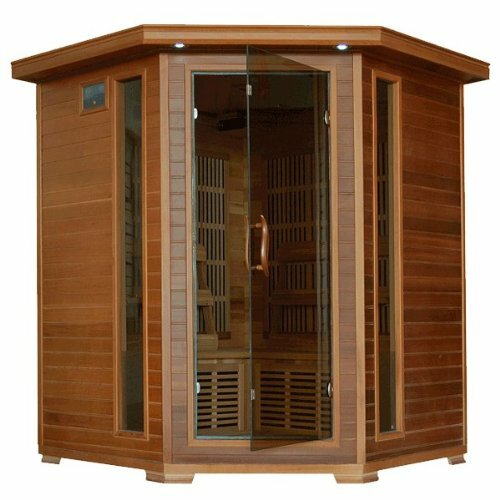 For those seeking a great home sauna experience for the whole family, the Hanko Elite B-Series 4-Person Infrared Corner Sauna is an excellent option. Representing great value for money, the Hanko Elite provides a spacious environment for up to four people while maintaining a high-quality, luxurious feel. The sauna also incorporates some additional features that are genuinely useful, many of which you would expect to find on more expensive products. Due to its clever three-sided frontage design, the sauna can fit into the corner of a room, with very little interior space being sacrificed. Featuring four panoramic windows and an L-bench seating arrangement, the design of the sauna is well thought-out and very practical. The construction of the sauna is solid, with it’s three-sided front exterior and interior manufactured from high-quality Hemlock. The sauna operates using a revolutionary carbon-flex infrared heating system both on and below the benching, with removable ceramic heated floor panels. This helps to ensure that the heat coverage within the sauna remains evenly distributed. Interior and exterior digital infrared controls, along with adjustable ceiling air vents allow the sauna always to be at the perfect temperature for a great experience. The lighting within the sauna is also tasteful, with spot lighting, color light therapy and a reading light providing a relaxing ambiance. When it comes to additional features, the Hanko Elite really is at the luxury end of the market. The sauna’s specification has some nice touches that keep pace with modern technology. These include items such as ceiling-mounted speakers, an FM radio tuner and a Saunapad Touchpad Audio interface, which is compatible with iPod, iPhone, and MP3 audio systems. Removable ergonomic hemlock backrests, an oxygen ionizer system, two peg robe hooks, and a magazine rack add to the useful range of features that can be of benefit to the whole family. For many people, ease of assembly is an important consideration when purchasing any sauna. Thankfully, the Hanko Elite is designed with this in mind. With the bench units, heating elements, lighting, and audio equipment pre-assembled, the remainder of the sauna’s modular wall, ceiling and floor panels can be erected as an easy two-person assembly. The therapeutic and relaxing qualities of a sauna have been known for hundreds of years. An outdoor sauna is an excellent method of adding a sense of luxury to your home and garden while maintaining a unique connection with the natural environment. A perfect place for meeting up and socializing with friends during the summer, or for snuggling up to a loved one on a cold winter’s night, an outdoor sauna can provide many benefits. The range of outdoor saunas on the market right now is immense. Whether you are looking for a traditional summer-house style sauna for a peaceful experience for the whole family or a futuristic and modern sauna to share at lively summer parties with friends, it’s possible to find an outdoor sauna that will fit perfectly with your tastes and requirements. Some of the additional accessories supplied with outdoor saunas these days are incredible, comparing well with some of the products used by the most expensive health clubs and salons. It’s now common to find equipment such as mood lighting, CD/FM Radio audio systems, and iPhone connectivity in many outdoor saunas. Most outdoor saunas are designed with durability and sturdiness in mind. Often constructed from tough, solid materials such as Canadian Hemlock or Cedar, an outdoor sauna can withstand some of the harshest weather that mother nature can bring. Suitable for a wide variety of outdoor spaces and surfaces, an outdoor sauna is one of the most useful and versatile products that you can buy. Below, we have our very own selection of what we think are the very best outdoor saunas on the market. Aside from their well-known therapeutic and relaxation qualities, there’s nothing quite like the back-to-nature feel of an authentic outdoor sauna. In fact, the Scandinavians have been using them for effectively hundreds of years. With the 4-person Hemlock Wood Outdoor Sauna, you can experience this unique feeling of peace and tranquility, all within your own back yard. 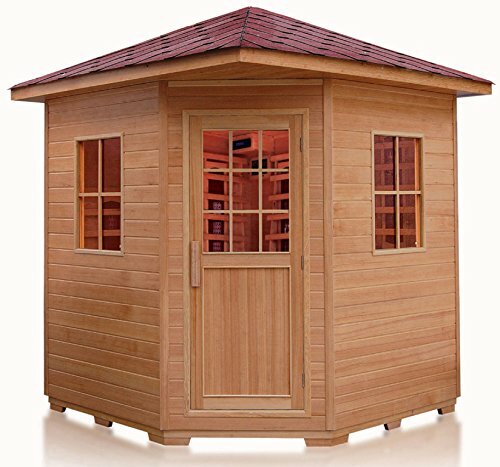 Tastefully designed with a fully shingled roof and tough tongue and groove Canadian Hemlock wood construction, this sauna has been created with quality and durability in mind. Featuring a weather sealed tempered glass door and windows, you can be sure that the cabin will remain 100 percent waterproof and protected from mother nature, even in the harshest of winters. One of the things that sets this outdoor sauna apart from many of it’s competitors is the way that it has been designed to blend in well with any structures that you may already have in and around your property. It could even be said that it looks more like a traditional summer house or cabin than a sauna, which makes this product an excellent choice for those concerned about how an outdoor sauna may fit alongside other features of the home or garden. The sauna’s interior is certainly spacious, with more than enough space to comfortably seat four adults on the two solid bench seats provided, making it ideal for spending time with the family or socializing with friends. 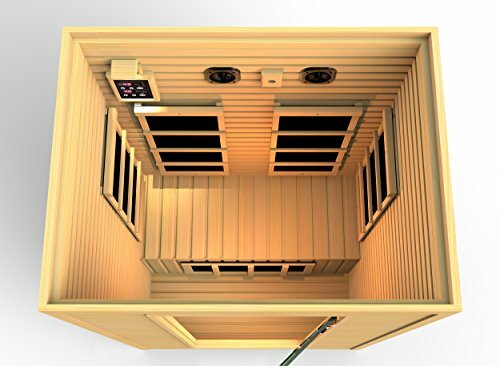 When it comes to the heating system, the six Ceramic Far Infrared Heaters supplied can quickly and efficiently heat the sauna to a comfortable operating temperature. As with many high-end saunas on the market these days, you can expect to find an impressive range of extra equipment, including four LED Reading Lights, a CD Player/Radio with two speakers, and an Ionizer with Ozone Generator. The sauna is also designed to be assembled and disassembled quickly and easily. This allows it to be portable if you ever decide to move home or simply wish to re-site the sauna elsewhere within your garden. Once the sauna has been assembled, simply have it connected to a 220v outdoor power supply, and you’re ready to go. What Is A Sauna And How Does It Work? Saunas may come in different variations or setups, but the fundamentals of how they work are similar. In a nutshell, a sauna is a small room or facility that has been preconfigured for high temperature heating with controlled humidity levels. For many cultures, saunas are part of an age-old tradition of relaxation and therapy. But over the past several years, more and more people have been using saunas either to lose weight or to simply gain from its health benefits, particularly in reducing stress and eliminating bodily toxins. Most saunas are designed out of a special type of wood that when heated releases a relaxing fragrance. However, there is much more to a sauna than extreme temperatures and a pleasant smell. For those trying to build a sauna for household use, there are two main kinds of sauna to consider – a dry one and a wet one. From a technical perspective, there is minute difference in the endgame. The choice you select will merely be a matter of preference. A dry sauna is preconfigured to be raised up to 250 degree Fahrenheit while keeping the humidity level at near zero to avoid any hot water problems. Meanwhile, a wet sauna, which is also called a steam room, maintains a lower temperature. It often fluctuates between 100 to 15 degrees Fahrenheit. This lower temperature level prevents hot water from scalding and potentially causing burn injuries to the user. The humidity level in both saunas are basically the same since the sweat generated by users cannot evaporate quickly enough to cool the body. In terms of heat source, there are different choices you have to keep in mind. Traditional saunas burn wood to generate heat, but modern saunas can now create the energy it needs via an infrared or electrical source. The latter options can offer the same heating experience, or sometimes even better, plus it tends to be the more environmentally sustainable alternative. Many traditional saunas also have stones that absorb the heat and later release it to heat the space independently, meaning even without the wood-burning mechanism working at the back-end. Special stones are used for a sauna setting as regular stones cannot structurally withstand continuous exposure to high temperatures. Basalt and Hornblende are two of the most common examples of stones used especially for sauna rooms. Of course now that there are infrared saunas available, these heat-absorbing rocks and wood-burning mechanisms have begun to reduce in number. Infrared technology simply provides a higher level of operational efficiency that cannot be equalled by sticks and stones. If you are attempting to build one for yourself and your family, make sure to consult a professional contractor who can oversee the construction process. When it comes to health, many people nowadays turn to the fast route, chugging on diet pills, starving themselves with tiny, insufficient meal portions per day, or getting surgery to remove elusive fat. All these techniques seems unnatural, expensive, and even life-threatening. What if you can lose weight while simultaneously removing bodily toxins? This is where sauna rooms enter the bigger, more organic picture. Sweating is the body’s mechanism to regulate its own temperature. However, unbeknownst to others, sweating also helps eliminate the man-made chemicals that the body absorbs from the surrounding environment. It can be absorbed by our bodies via food, water, and even air. Regardless of how natural your diet or lifestyle may be, these toxins will find a way to enter the body. By regularly going to a sauna, you are able to sweat more easily and in greater amounts, which effectively removes more of the chemicals, such as pesticides and drugs, that your body absorbs. Sitting down in a sauna room might not make your heart feel great right away, but the long-term benefits are indeed backed up by scientific evidence. A session in the sauna mimics the health benefits of mild exercise. The heart gets a warm-up while the heated conditions cause a dilation of the blood vessels, which consequently enhance blood flow. In addition, recent studies have found that using the sauna regularly is particularly beneficial for the prevention and treatment of congestive heart failure. In a test conducted to 15 patients with congestive heart failure, a significant decrease in blood pressure and simultaneous increase in the heart’s pumping ability was found after the patients underwent daily sauna sessions for one month. For outsiders, it may seem awkward to hang out with a bunch of naked folks while steaming up every spot on your body. However, you may be surprised of how mature people are when using sauna rooms. In addition, it can serve as a good place to bond with family members, friends, and gym buddies or to meet new people altogether. For those who own a private sauna, it can be difficult to grab this particular benefit. Nonetheless, having one indoor gives you the opportunity to invite people who share the same interest and enthusiasm in sauna rooms and their associated health benefits. Saunas cover the whole skin surface, from head to toe. As people grow older, the skin loses more and more of its elasticity. As a result, pores get easily clogged up by the buildup of dead skin cells. By going to the sauna regularly, blood flow to the skin is greatly improved, which helps in the production of new, healthy skin cells and the simultaneous removal of dead ones. The body’s natural oils also flow more freely throughout the entire body including hard-to-reach extremities during sauna sessions. This results in a more youthful-looking skin without the need for cosmetic products, which commonly harbor chemicals that are tough on the skin. Saunas provide a range of health benefits and date back thousands of years. Modern saunas most resemble those with originated in traditional Finnish culture and consist of a small, enclosed room with a source of heat. Today saunas are often utilized for relaxation purposes, as well as to help soothe sore and tired muscles. There are also detoxification benefits associated with saunas. For the most part, you can find three main types of saunas: wood burning, infrared, and electric. Wood burning saunas are the closest models to the traditional Finnish saunas that we have. This type of sauna, as the name would suggest, utilizes a small stove, which slowly burns wood to heat the sauna stones and the sauna room. This simple design puts off a unique, wood aroma and crackling wood burning sauna, which many find relaxing. These saunas are easy to install because they don’t require electricity and can often be found in gardens or attached to homes in Europe. Wood burning saunas put off a penetrating, dry warmth. Steam can be generated in these saunas by pouring water over the sauna rocks. The rocks also help to control the temperature of the sauna. Electric saunas are similar to wood burning saunas, but they use electricity rather than wood to generate heat. These are popular in private homes because of how easy they are to install and maintain. The temperature in an electronic sauna can be manually maintained and often they come with a remote control and timer function. The downside of the electric sauna is that it doesn’t provide the same smell and ambiance of a wood burning sauna. Many try to work around this by building electric saunas with aromatic wooden walls. Infrared saunas are the latest in sauna innovations. These are becoming increasingly popular among commercial spas and health clubs because they are relatively affordable and work well in small spaces. They also utilize less energy than wood burning or electric saunas. Infrared saunas contain heating elements, which emit rays that are directly absorbed into the body, rather than heating the sauna room or sauna stones. Infrared saunas are shown to improve blood circulation, in addition to the traditional sauna health benefits.